We start our journey from Bari, the capital of Puglia: the city is located along the coast; its sea front is the longest in Italy and hosts a bustling ferry port with ships departing mainly to Albania, Greece and Croatia. The city consists of three different parts: Bari Vecchia (the old town), the 19th century district called Murattiano, definitely the heart of the new city and finally the new city. The old town represents the soul of this city and preserve most of its history. Wander through its streets and small alleys and discover more than 40 churches and enjoy the atmosphere of this picturesque labyrinth. 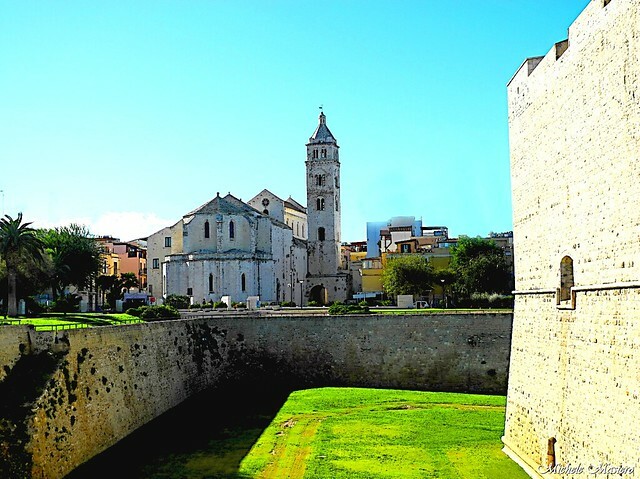 Few kilometres North of Bari is located Giovinazzo, a lovely town and important fishing port. The town preserve the historical city centre, accessible through the Arco Traiano, with the Cathedral dedicated to Santa Maria Assunta and the Ducal Palace. Inland not far from Giovinazzo is Bitonto which links its name to the production of high-standard olive oil. The town also hosts one of the most beautiful Romanesque Cathedral in Puglia: built in the 12th century it is dedicated to St. Valentine and has a dramatic facade with a large rose window. Back on the coast up north we find Trani, a beautiful city well represented by its marvelous Cathedral built on the water’s edge and dedicated to San Nicola Pellegrino. The city is also home to the 13th century Swabian castle built by Federick II. Further north on the coast is Barletta, the city is famous for the Disfida di Barletta (challenge of Barletta), an altercation between Italians and French. The Italians won and the battle is celebrated every year. Other symbols of the city are the big bronze Colosso statue, the Swabian castle and the Romanesque Cathedral. Leaving the coast and moving towards the inner land we go across Andria and discover one the hallmarks of the whole region of Puglia: situated on top of a hill is Castel del Monte, the most important and mysterious castle built by the emperor Frederick II which has been a UNESCO World Heritage Site since 1996. Castel del Monte is right in the middle of the Parco dell’Alta Murgia, this park was formed in 2004 and covers an area of 900 sq km. It is an uncontaminated land mainly formed by rocky ground, wood forest and underground caves, 1500 species of wild plants live here, a foot-print of dinosaurs have also been found. Heading south we find Gravina in Puglia, this scenic town offers a marvelous landscape as it is perched on the edge of the ravine. The ravine is full of caves which have been inhabited for centuries and have been used as a refuge. To visit is the Cathedral of Assunta that overlooks the ravine. Only 10 km from Gravina on a hilly territory is located Altamura, this is a must see town for food lovers: it was created by Frederick II who named it città libera (free city) and today it is notorious around the world for its bread, Pane di Altamura; it is in fact the first bread in Europe to be awarded with the protection of quality marks PDO (Protected Designation of Origin). Keeping our journey towards the coast we find Gioia del Colle, we recommend to taste the mozzarella, definitely the best in the region. Further east, driving through olive groves we come to Putignano, this town is home to the oldest carnival in the world. It starts on St. Stephen day after Christmas when the relics of St. Stephen are transferred from Monopoli to Putignano with a procession which signs the beginning of the carnival period; it lasts for over two months and ends with a massive parade of papier-mâché floats. Further south we find Alberobello with its marvellous cone-shaped trulli houses and whose old city centre has been a UNESCO World heritage site since 1996, one of the symbol and probably the most bizarre village in Puglia. Locorotondo, defined one of the borghi più belli d’Italia (one of the most beautiful old city center in Italy) with its white washed houses is a natural balcony to the extraordinary landscape of the Itria Valley and is home to the best white wine in the region. Heading north we find Castellana Grotte with its wonderful limestone caves, a visit to this karst system is a must as you will marvel at all those stalagmites and stalactites which will guide you to the Grotta Bianca (White Cave) defined as the most gleaming cave in the world. Back on the coast we find the ruins of Egnazia, a Greek-Messapian town which dates back the 13th century BC, a fascinating place and one of the most important archaeological sites in Puglia. Heading north along the coast we discover a series of beautiful seaside towns: Capitolo with its lovely beaches and a very active night life. Monopoli, a walled seafront town with a 18th century baroque styled Cathedral and a characteristic Porto Vecchio (Old harbour) crowded of coloured fishing boats. Perched on a rocky promontory is Polignano a Mare, a spectacular tourist resort and a pearl on the Adriatic Sea. Of Greek origins, the old town still preserves the typical white washed houses and little cobbled alleys; the Lama Monachile Bridge offers the best view for a picture as it overlooks the blue sea and a small beach surrounded by high rocky walls. Last stop is in Mola di Bari, a fishing port and refuge for Baresi who wants to escape from the busy city during hot summery days. The town is home to the Angevin Castle and the Van Westerhout Theatre. Our journey through this fantastic land ends to our starting point, in the city of Bari.